This video features Garth Knox performing one of the movements from his piece Cinq Petites Entropies for viola d’amore and clarinet during the Café OTO Showcase performance, filmed and edited by Jonathan Grimes. 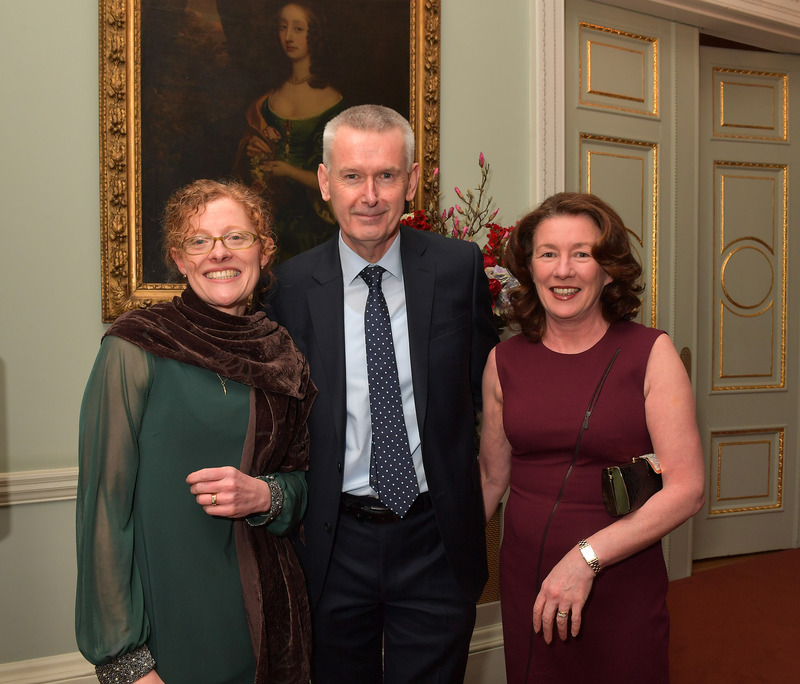 CMC Director Evonne Ferguson with Ambassador Adrian O'Neill and his wife Aisling, photo credit: Mark Allan. Last week, CMC launched new music::new Ireland three at two signature events in London: the international launch of the double album by Ambassador Adrian O’Neill at the Embassy of Ireland in London and a Showcase performance of contemporary music from Ireland in Café OTO, home to adventurous new music in London. This double album is the latest edition of the promotional recording series new music::new Ireland, and presents works by 16 composers from Ireland who represent a diverse range of contemporary genres and styles. 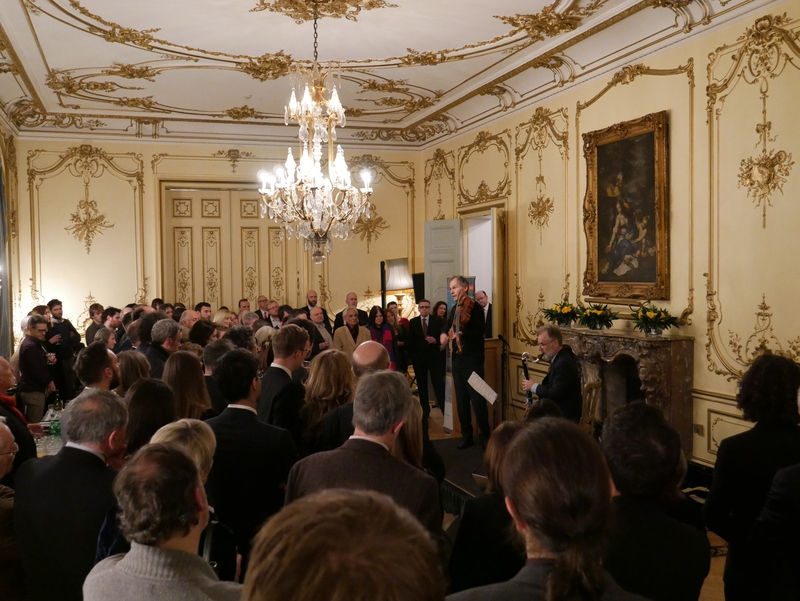 Garth Knox (viola d'amore) and Paul Roe (clarinet) perform at the Embassy of Ireland in London, photo credit: Jonathan Grimes. 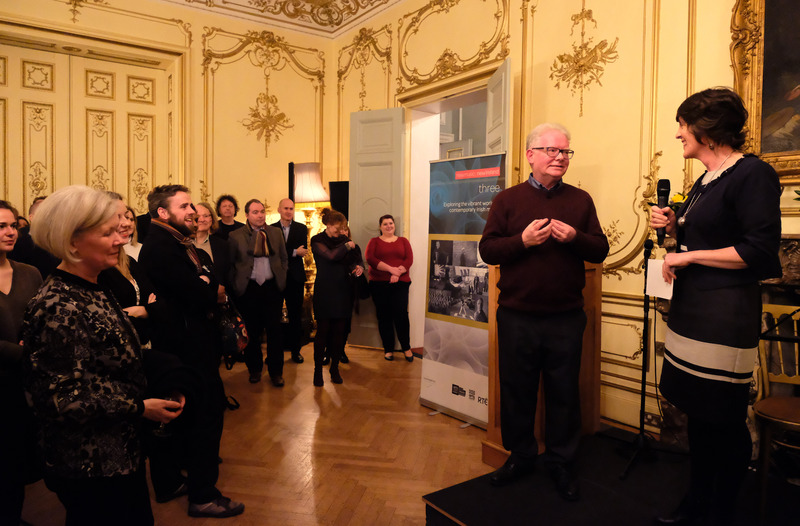 On 6th February, Ambassador O’Neill gave a warm welcome to a packed ballroom at the Embassy, and launched the CD. Evonne Ferguson painted a picture of the contemporary music scene in Ireland before introducing performers Paul Roe, Garth Knox and Elizabeth Hilliard in turn as they performed works by composers Elis Czerniak, Kerry Hagan, Garth Knox and Matthew Whiteside. These performances were complemented by an interview by Linda O’Shea Farren with composer Kevin O’Connell on his reflections on contemporary music from Ireland from the 1980s to the present day. Following the presentation of a gift by CMC to the Ambassador, he invited the guests to mingle and enjoy the hospitality in the beautiful surroundings of the Embassy’s iconic building on Grosvenor Place. Linda O'Shea Farren (CMC) interviews Kevin O'Connell during the London launch of new music::new Ireland three, photo credit: Mark Allan. 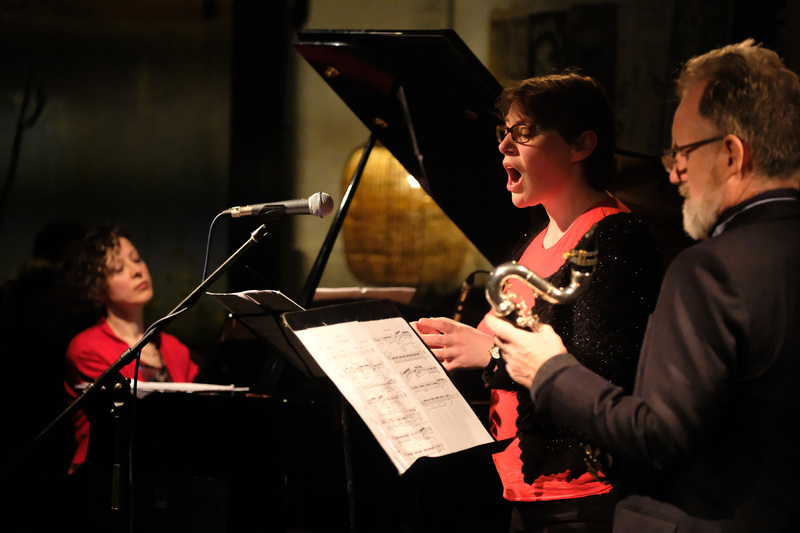 At Café OTO the following evening (7th February), CMC presented a unique Showcase of works by composers featured on the double album in the heart of contemporary music in London. Performers Garth Knox, Xenia Pestova, Paul Roe, Elizabeth Hilliard, Kerry Hagan, Ruaidhrí Mannion and Elis Czerniak played to a full house works by Ed Bennett, David Fennessy (premiere), Ailís Ní Riain, Kevin O’Connell and Matthew Whiteside, as well as by Garth, Kerry, Ruaidhrí and Elis. In between performances, the evening also featured interviews by Evonne Ferguson and Jonathan Grimes with composers and performers about their work. 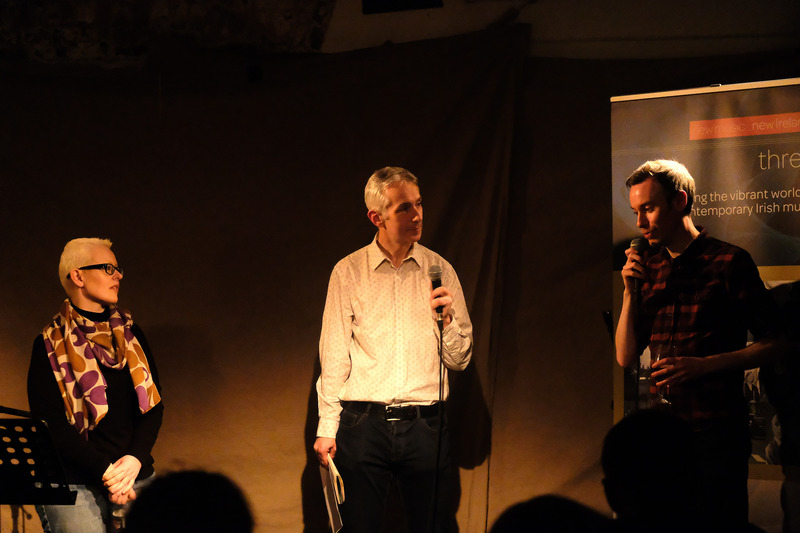 Jonathan Grimes (CMC) speaks with Ailís Ní Ríain and Ed Bennett during the Café OTO Showcase, photo credit: Mark Allan. The new music::new Ireland series and launch events are made possible with funding from the Arts Council of Northern Ireland’s Artist Development Fund, Culture Ireland’s GB18 programme and ongoing support from the Arts Council of Ireland/An Chomhairle Ealaíon. CMC would also like to thank the Embassy of Ireland in London for hosting the launch event. See also: a Storify page with a selection of images, video clips and Tweets from the event.